From left: Dr Cath Moore and Marco Barsanti representing QIAGEN, Marios Koutsakos, Hillary Vanderven and Professor Andrew Brooks. QIAGEN proudly sponsors two QIAGEN PhD Achievement Awards to recognise highly productive PhD students from the Department of Microbiology and Immunology at the University of Melbourne. 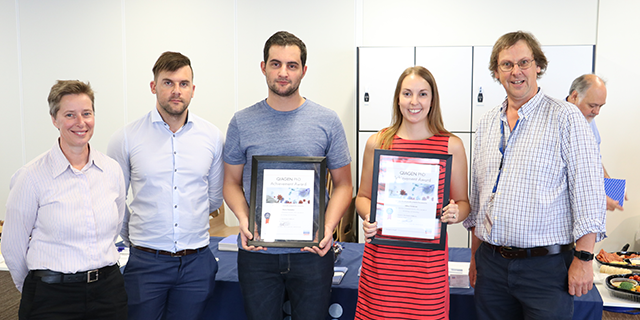 On the 19th of October, two QIAGEN PhD Achievements Awards, valued at $1000 and $500, were awarded by the QIAGEN representative Dr Cath Moore and Head of Department Professor Andrew Brooks. The winner of the 2017 QIAGEN award was Marios Koutsakos, from Professor Kedzierska's laboratory, for his work on understanding immune protection against influenza viruses, particularly the understudied influenza B viruses. During his PhD, Marios was the first to show that CD8+ T cells can provide universal immunity across all influenza types (A, B and C). He also provided the first evidence on how influenza-specific B cells are distributed across seven different human tissue compartments. His PhD work so far has led to seven published and four submitted manuscripts as well a patent based on his universal T cell work. The runner up was Hillary Vanderven, from Professor Kent's laboratory, for her work on antibody-dependent natural killer cell activation towards influenza vaccines and influenza viruses, including her collaborative work with Fudan University on the new avian H7N9 virus. Hillary’s PhD work led to eight publications, including her first-author manuscript in JCI Insights.